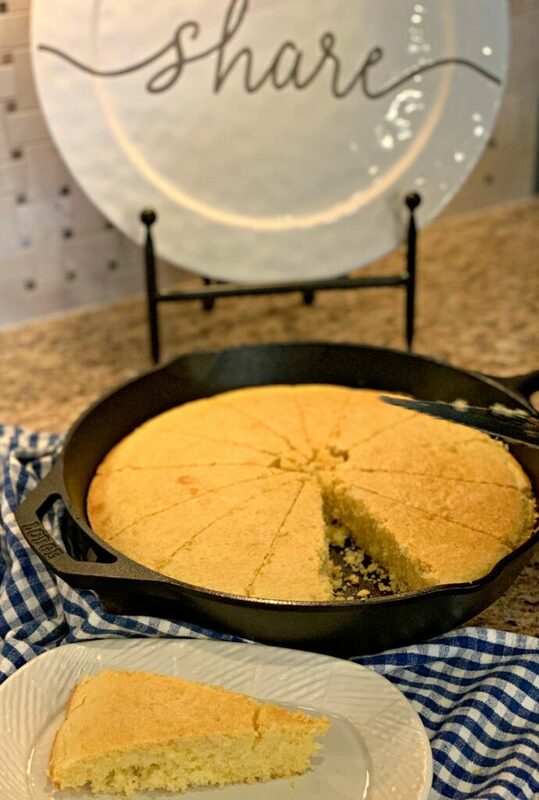 This slightly sweet cornbread is made in the versatile cast iron skillet! Having a crunchy, buttery crust, and being light and fluffy on the inside, this pairs well with any meal! A while back, well, Superbowl to be exact, my parents had my family over for chili and cornbread! 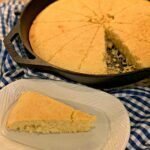 She made this cornbread in her cast iron skillet and we all thoroughly enjoyed it. Dipped into my chili (since that’s how I eat it), it was a favorite! 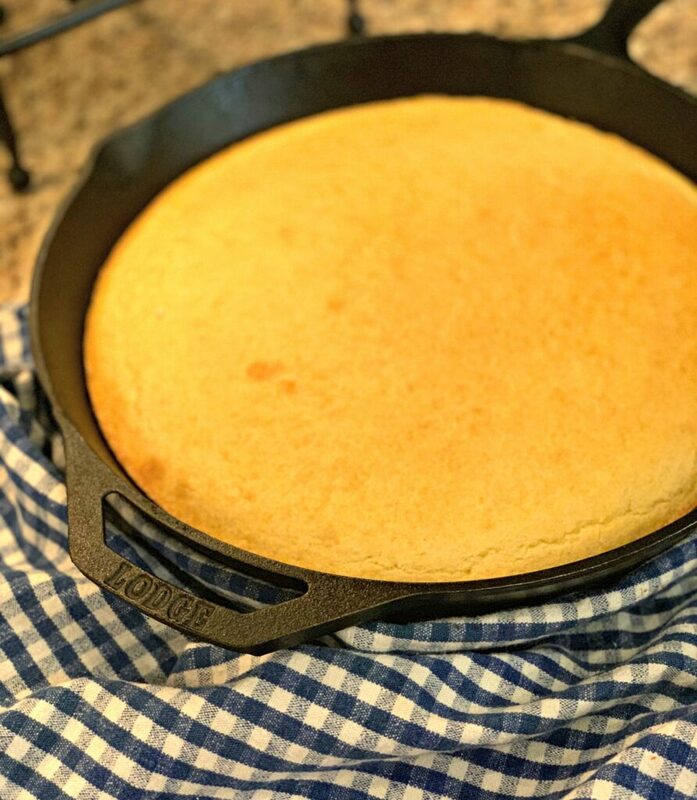 If you scroll through the cornbread recipes on my blog, you’ll notice I LOVE my sweet cornbread. All the recipes I have shared over the years are great, but being sweet, sometimes you just need a good ol’ non sweetened version, right?! Everyone has their preference on whether they prefer sweet or unsweetened. I typically lean towards sweet, but I will say, this was quite tasty and really allowed the corn flavor to shine through versus the sugar taking over, haha! 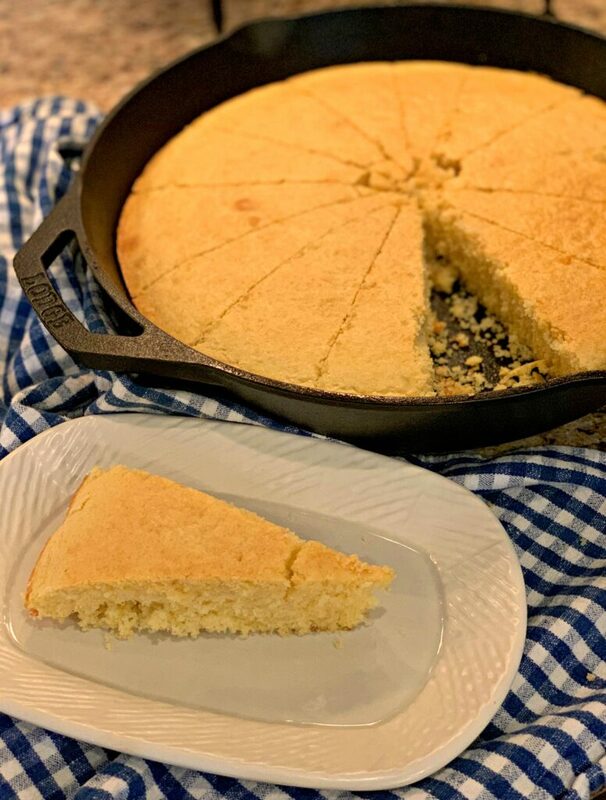 Not only was this simple to throw together, but cooking it in the cast iron skillet enhanced the buttery crust and gave it a slight crunch. The inside of the cornbread was light and fluffy, just how we prefer it! Enjoy and be sure to let me know what you think if you try it! 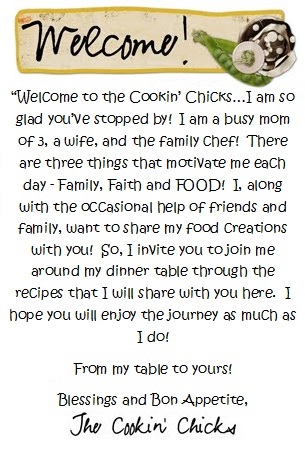 You can even tag me in your pictures on Instagram using the hashtag #thecookinchicks. *Don’t forget to sign up for my newsletter below! 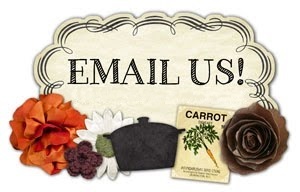 I’ll send you my latest recipes directly to your inbox so you never miss anything! Plus, I do monthly prize giveaways for my subscribers only! Win win, right?! Preheat the oven to 425 degrees and place skillet into oven to warm up. In a large bowl, combine the cornmeal, flour, sugar, salt, baking powder, and baking soda. Whisk in the milk, buttermilk, and eggs. Add in 7 tbsp of butter (leave 1 tbsp melted butter for the skillet). Remove skillet from oven and lower temperature of oven to 375 degrees. Pour remaining 1 tbsp butter onto bottom of skillet and move around to coat evenly. Pour batter into warm skillet and place into oven. Bake for 22-25 minutes, or until cooked through. Remove from oven and allow to sit for about 10 minutes before serving! Enjoy! I have saved lots of your recipes and already made some. I always look forward to your messages. I have been using iron skillets, I am sure, way before you were born. My mother and my mother-in-law before me. They make really good cornbread. I know lots of your viewers probably never used iron skillet. They are missing something if they have not been using them. Keep the good recipes coming. Awww thanks for the kind words! I sure love cast iron cooking and highly encourage it to anyone I come across! Enjoy and have a wonderful weekend! Can you make them without the sugar. It looks lovely. Sure! It just wouldn’t have any sweetness to it, but if that is okay with you, feel free to omit!